Horizon related operations can be found in the Operations tab in Map View. Before you begin, select a volume in the Horizon Details Panel. This volume will override any volume selected in the View window for all horizon operations. Note: Most operations can create a new horizon when complete. If this option is chosen, the new horizon is named according to the operation. The notes for the new horizon contain the settings for the function used to create it. Operations that update a horizon do not update the notes. Horizon Amplitude Extraction — This operation extracts amplitude from a volume between two horizons. Derivative Filter — The Derivative Filter operation allows you to filter out the lower quality picks by searching for horizon areas with sudden change in gradient value. Erase - The Erase operation allows you to selectively delete parts of the horizon. A horizon must be selected in the Map view for this operation. Extract — The Extract operation extracts a non-gather horizon from a gather horizon. A new horizon can be created in the process. Ghost— This operation simply allows you to create a copy of the horizon at a time/depth away from the original horizon. 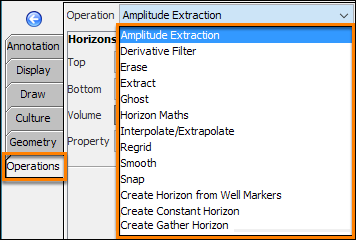 Horizon Maths — Insight allows mathematical operations to be run on a horizon in Horizon Maths. A new horizon can be created based on the results of the computation. Interpolate/Extrapolate — Interpolation and extrapolation helps you fill in the small areas of the horizon that are not defined. Regrid — The Regrid operation lets you regrid a horizon to the X/Y or IL/CL grids, or 2D lines. This is particularly useful to regrid multi-survey horizons. Smooth — This page teaches you how to smooth a horizon through the averaging of multiple inline and crossline values. Snap — This feature allows you to fine-tune a horizon so that it is positioned consistently on a specific part of the trace waveform. Create Horizon from Well Markers — This operation creates a regular IL/CL or X/Y horizon from a set of well markers. Create Constant Horizon — Creates an IL/CL or X/Y horizon at a constant time or depth. Create Gather Horizon - Creates a gather horizon from a non-gather horizon. The result will be a horizon that is flat across each gather.